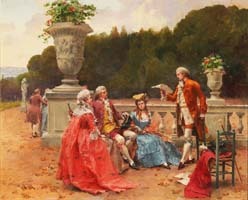 Henri Victor Lesur (Roubaix, France 1863-1900) A Fine French 19th Century Oil on Panel Titled "Poetry at the Park" (Poésie dans le parc) Depicting an 18th Century park scene of a standing young young Gentleman reciting poems to a couple of ladies and a gentleman at the 'Jardin des Tuileries' which was the garden for the 'Palais des Tuileries' built by Catherine de Medicis. Circa: Paris, 1890. Note: The artist is also known as Henry Victor Lesur. Like many of his contemporaries during the last quarter of the 19th Century, Lesur's works took inspiration from scenes of French 18th Century life, romance and every day enjoyment. Victor Gabriel Gilbert, Louis Marie de Schryver, Vittorio Reggianini, Maurice Leloir, Charles Soulacroix, Jean Meissonier, Johann Hamza and Luis Jiminez y Aranda and Henry Victor Lesur chose to paint these type of charming, romantic and beautifully detailed costume paintings. The artist Alfred Stevens quoted "The public are attracted to costume subjects in the same way that they fall in love with the fancy dress of a masked ball". 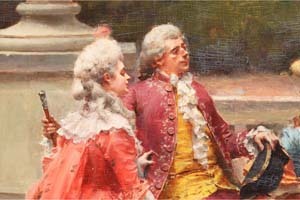 Lesur's works appear to have also been inspired by the Roccoco works by Jean-Honore Fragonard (French, 1732-1806) and François Boucher (French, 1703–1770). The fine attention to detail of the flower seller's silk dress as well as the gentleman's rich attaire and gesture, the colorful flowers and the French cobble stone street with the buildings in background are beautifully and richly captured as a frozen moment in time. Henry Victor Lesur was born in Roubaix on April 28, 1863 and received his formal training in the atelier of Francois Flameng - a professor at l'Ecole des Beaux-Arts. 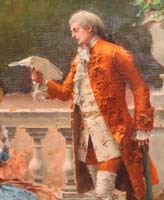 Under his tutelage, Lesur received the academic training he needed and developed a love for highlife genre (costume) subjects. 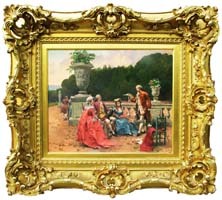 From the 1880's and 1890's Lesur exhibited at the Paris Salon. Among them were Portrait de M.J. Stirling Dyce (1888); Portrait de M.M. Caplain (1890); Portrait de M. Alfred Loreau, Député du Loiret (1892) and Portrait de Mlle. Wanda de Boncza (1895). 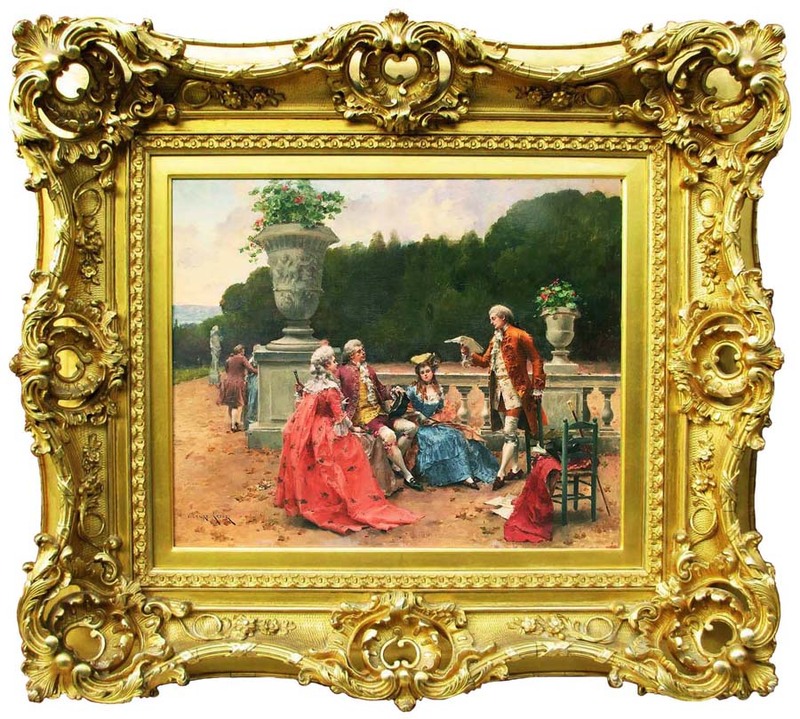 It is important to note that most of the works exhibited by Lesur were portraits, when in fact he is best known for his works featuring pretty women and handsome men dressed in 18th century costume conversing in a garden or walking through a public place or flower market. Lesur received a medal at the Salon in 1887 and at the Exposition Universelles of 1889 and 1900. Literature: E. Benezit Dictionaire des Peintres, Sculpteurs, Dessinateurs et Graveurs by Grund - Nouvelle Edition, 1976 - Volume 6, Page 619. 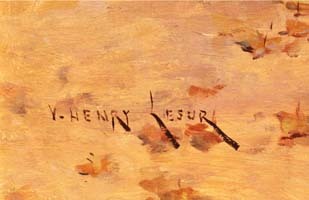 Note: The artist is also known as Henry Victor Lesur. Like many of his contemporaries during the last quarter of the 19th Century, Lesur's works took inspiration from scenes of French 18th Century life, romance and every day enjoyment. Victor Gabriel Gilbert, Louis Marie de Schryver, Vittorio Reggianini, Maurice Leloir, Charles Soulacroix, Jean Meissonier, Johann Hamza and Luis Jiminez y Aranda and Henry Victor Lesur chose to paint these type of charming, romantic and beautifully detailed costume paintings. 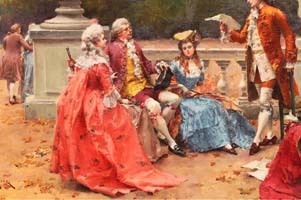 The artist Alfred Stevens quoted "The public are attracted to costume subjects in the same way that they fall in love with the fancy dress of a masked ball". Lesur's works appear to have also been inspired by the Roccoco works by Jean-Honore Fragonard (French, 1732-1806) and François Boucher (French, 1703–1770). The fine attention to detail of the flower seller's silk dress as well as the gentleman's rich attaire and gesture, the colorful flowers and the French cobble stone street with the buildings in background are beautifully and richly captured as a frozen moment in time. 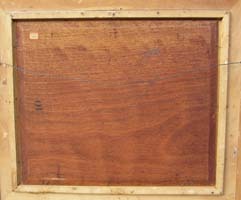 From the 1880's and 1890's Lesur exhibited at the Paris Salon. Among them were Portrait de M.J. Stirling Dyce (1888); Portrait de M.M. Caplain (1890); Portrait de M. Alfred Loreau, Député du Loiret (1892) and Portrait de Mlle. Wanda de Boncza (1895). It is important to note that most of the works exhibited by Lesur were portraits, when in fact he is best known for his works featuring pretty women and handsome men dressed in 18th century costume conversing in a garden or walking through a public place or flower market. Lesur received a medal at the Salon in 1887 and at the Exposition Universelles of 1889 and 1900. E. Benezit Dictionaire des Peintres, Sculpteurs, Dessinateurs et Graveurs by Grund - Nouvelle Edition, 1976 - Volume 6, Page 619.